Post: Gaurav Akrani. Date: 12/04/2010. No Comments. Label: Economics. A direct tax is one, which is paid by a person on whom it is legally imposed and the burden of which cannot be shifted to any other person. The person from whom it is collected cannot shift its burden to anybody else. Image Credits © Slightly North. The tax-payer is the tax-bearer. The impact i.e. the initial burden and its incidence i.e. the ultimate burden of direct tax is on the same person. For e.g. Income tax, wealth tax, property tax, estate duties, capital gain tax, corporate / company tax, etc. are all direct taxes. There is social justice in the allocation of tax burden in case of direct taxes as they are based on the principle of ability to pay. 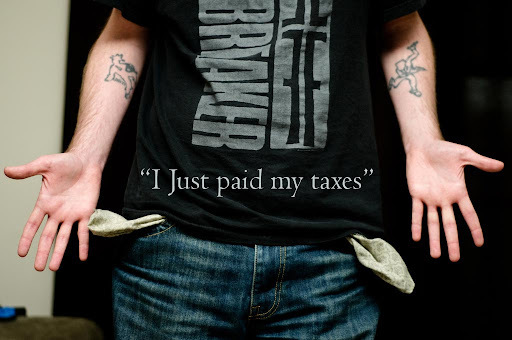 Persons in a similar economic situation are taxed at the same rate. Persons with different economic standing are taxed at a different rate. Hence, there is both horizontal and vertical equity under direct taxation. Progressive direct taxation can reduce income inequalities and bring about adequate social & economic justice. For example, in the Indian Budget of 2007, individual with an income of upto Rs. 1,10,000 are exempted from payment of income tax and in the case of women tax payer, the exemption limit is Rs. 1,45,000. As far as direct taxes are concerned, the tax payer is certain as to how much he is expected to pay, as the tax rates are decided in advance. The Government can also estimate the tax revenue from direct taxes with a fair accuracy. Accordingly, the Government can make adjustments in its income and expenditure. The direct taxes are relatively elastic. With an increase in income and wealth of individuals and companies, the yield from direct taxes will also increase. Elasticity also implies that the government's revenue can be increased by raising the rates of taxation. An increase in tax rates would increase the tax revenue. They have educative value. In the case of direct taxes, the taxpayers are made to feel directly the burden of taxes and hence take keen interest in how public funds are spent. The taxpayers are likely to be more aware about their rights and responsibilities as citizens of the state. Direct taxes are generally economical to collect. For instances, in the case of personal income tax, the tax can be deducted at source from the income or salaries of the individuals. Therefore, the government does not have to spend much in tax collection as far as personal income tax is concerned. However, in the case of indirect taxes, the government has to set up an elaborate machinery to collect taxes. The direct taxes can help to control inflation. During inflationary periods, the government may increase the tax rate. With an increase in tax rate, the consumption demand may decline, which in turn may reduce inflation. In India, there is good amount of tax evasion. The tax evasion is due to High tax rates, Documentation and formalities, Poor and corrupt tax administration. It is easier for the businessmen to evade direct taxes. They invariable suppress correct information about their incomes by manipulating their accounts and evade tax on it. In less developed countries like India, due to high rate of progressive tax evasion & avoidance are extensive and led to rise in black money. The direct taxes tend to be arbitrary. Critics point out that there cannot be any objective basis for determining tax rates of direct taxes. Also, the exemption limits in the case of personal income tax, wealth tax, etc., are determined in an arbitrary manner. A precise degree of progression in taxation is also difficult to achieve. Therefore direct taxes may not always fulfill the canon of equity. Direct taxes are inconvenient in the sense that they involve several procedures and formalities in filing of returns. For most people payment of direct tax is not only inconvenient, it is psychological painful also. When people are required to pay a sizeable part of their income as a tax to the state, they feel very much hurt and their propensity to evade tax remains high. Further every one who is required to pay a direct tax has to furnish appropriate evidence in support of the statement of his income & wealth & for this he has to maintain his accounts in proper form. Direct tax is considered inconvenient by some people because they have to make few lump sum payments to the governments, whereas their income receipts are distributed over the whole year. In India, there is a narrow coverage of direct taxes. It is estimated that only three percent of the population pay personal income tax. Due to low coverage, the government does not get enough funds for public expenditure. Estate duty & wealth tax are equally narrow based and thus revenue proceeds from these taxes are invariably small. The direct taxes can affect savings and investment. Due to taxes, the net income of the people gets reduced. This in turn reduces savings. Reduction in savings results in low investment. The low investment affects capital formation in the country. Highly progressive direct taxes reduce people's ability and willingness to work and save. This in turn may have a negative impact on investment and productive capacity in the economy. If tax burden is high, people's consumption level gets adversely affected and this has an impact on their ability to work and save. High taxes also discourage people from working harder in order to earn and save more. In India, there is Sectoral imbalance as far as direct taxes are concerned. Certain sectors like the corporate sector is heavily taxed, whereas, the agriculture sector is 100% tax free. Even the large rich farmers are exempted from payment of personal income tax. In direct tax burden of tax cannot be shifted. The disadvantage of direct taxation are mainly due to administrative difficulties and inefficiencies. The extent of direct taxation should depend on the economic state of the country. A rich country has greater scope for direct taxation than a poor country. However direct taxation is an important aspect of the modern financial system.